– A systemic and inclusive vision to inspire action, both individual and collective. – The construction of the organization’s own model to facilitates profitable innovation. – Availability of resources and techniques for the efficient practice of innovation. 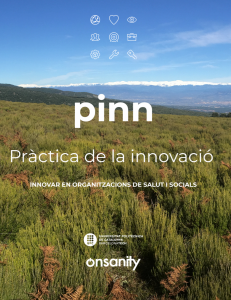 The PINN proposal, for the Practice of Innovation, is the result of the joint work of Josep Mª Monguet (UPC) and Alex Trejo (Onsanity), who since 2010 have developed and validated an innovation management model, supported by participative strategies and experienced in a diversity of health and social centres.